HYANNIS, Mass. – Charlie Furbush (St. Joseph’s, Maine) had plenty of highlights this season, between starting the All-Star Game, throwing a no-hitter against the Bourne Braves, and pitching 8 1/3 innings to beat the number one team in the league, the Cotuit Kettleers. All of these accomplishments culminated Sunday in Hyannis when the lefty was awarded the league’s sixth John Claffey New England Top Prospect Award. The award goes to a player who either lives or plays for a college in the New England area. Furbush falls under both qualifications, as he calls South Portland, Maine home and has been one of St. Joseph’s ace pitchers for the past two years. He will be transferring to LSU in the fall. Though he has played most of his baseball in Maine, Furbush credits a large part of his success to playing in the Cape League. Claffey, the award’s namesake, was the general manager of the Wareham Gatemen from 1984 to 1989 and led his team to three playoffs with one season ending in a league championship. After that he served as CCBL president from 1990 to 1991. Previous winners of the prestigious award are Wareham’s Ben Crockett (Harvard), Ryan Hanigan (Rollins) of Orleans, Chris Lambert (Boston College) of Chatham and Frank Curreri (UMass) of Yarmouth-Dennis. Most recently in 2005, Tim Norton (UConn) of Falmouth was honored with the award. Furbush was 3-2 on the season and was 10th in the league with a 1.83 ERA. 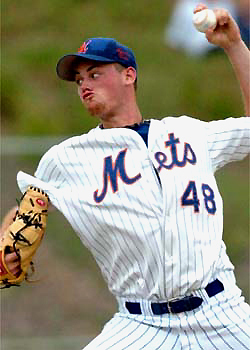 He threw 54 innings for the Hyannis Mets, first on the team and second among all pitchers. He sat down 50 batters by way of the strikeout on the season while surrendering only 13 walks and 11 earned runs in nine appearances, including seven starts. This was Furbush’s second season with the Hyannis Mets, and head coach Greg King has seen the improvements that the young pitcher has made. He also has seen Furbush take charge on the mound this season, helping the Mets to a 16-24-3 record, a major step in the right direction from their 7-36-1 record last year. Furbush will be taking a giant leap this year, going from small St. Joseph’s to the talent-filled SEC playing for LSU. The jump should be a lot easier for him, though, now that he has spent two summers facing – and dominating – some of the best players in the country.